The exhibition at Kasa Gallery follows Bill Balaskas’ intervention on the facade of the Royal College of Art in London, one of the most renowned art schools in the world. 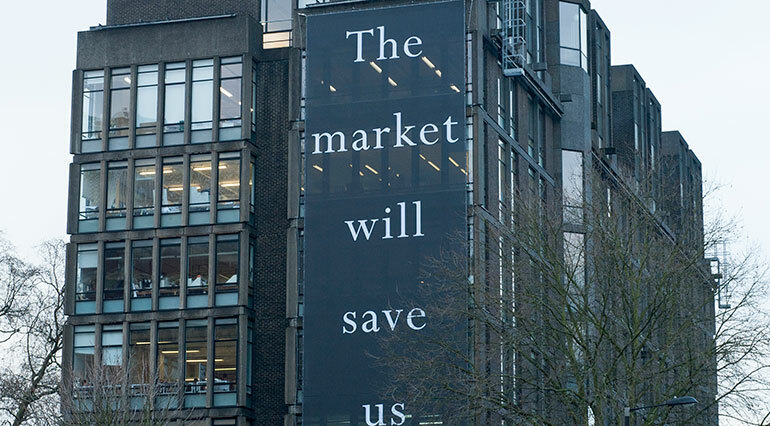 In this unique and historical public location, next to the Royal Albert Hall, a 23-meter high banner will cover the facade of the Royal College of Art, featuring the phrase The market will save us. Originally from Greece, Balaskas studied Economics before moving to London in order to study art. During the last few years, he has produced a body of work that reflects on the global economic crisis and the nature of capitalism. His videos and installations have been widely exhibited to international acclaim. Balaskas’ forthcoming solo show in Istanbul, entitled The Market Will Save the World, is inspired by the intervention at the RCA and takes place at Kasa Gallery, a distinct exhibition space located in the vault of a former bank. The exhibition at Kasa Gallery will open on January 25, 2013 with a performance during which Bill Balaskas will be handing helium balloons with the RCA banner phrase The market will save us printed on them. The balloons will be signed by the artist and tied on the wrists of 100 visitors on the opening night. Kasa Gallery, which is supported by Sabanci University, will also present as part of the exhibition the phrase The market will save us as a public advert on a full page of Frieze magazine’s March issue. By becoming part of the magazine, Bill Balaskas’ artwork shall adopt the dual and ambivalent character of an advert/commentary on the influence of globalized capitalism on art. This is a Kasa Gallery collaboration with the Royal College of Art, Kalfayan Galleries (Athens - Thessaloniki) and the Museum of Contemporary Cuts (MoCC). The exhibition is curated by Lanfranco Aceti (Kasa Gallery Director and Senior Curator), Ozden Sahin (Curator) and Jonathan Munro (Curatorial Assistant). We thank for their gracious support: Sabanci University, the Royal College of Art and Kalfayan Galleries (Athens - Thessaloniki). Bill Balaskas (b. Thessaloniki, Greece, 1983) is a London-based artist working across different media. Balaskas is a research student in the MPhil/PhD programme in Critical Writing in Art & Design at the Royal College of Art, London and holds an MA (2010) in Communication Art & Design from the same college. In 2008 he earned a BA (Hons) in Video Arts Production from the University for the Creative Arts, Maidstone (UK), and in 2004 a BSc in Economics from Aristotle University of Thessaloniki (Greece). His work has been widely exhibited internationally. Recent and forthcoming solo exhibitions include presentations at KASA Gallery (Sabanci University), Istanbul; New Positions (Art Cologne), Cologne (both 2013); Kalfayan Galleries, Athens (2012); Institut Français de Thessalonique (3rd Thessaloniki Biennale of Contemporary Art), Thessaloniki (2011); Jewish Museum, London; and Sketch Gallery, London (both 2010). Balaskas recently represented the UK in the London 2012 Cultural Olympiad and in Maribor, Slovenia, European Capital of Culture 2012. Also, he is an awarded writer and an editor for the Leonardo Electronic Almanac (The MIT Press). In April 2012, the Global Board of Contemporary Art pronounced him as one of the four most important emerging artists around the world (ALICE Awards 2012) and he is currently a nominee for the 2013 AUDI Art Award of Art Cologne for the most innovative young artist. Bill Balaskas is represented by Kalfayan Galleries (Athens - Thessaloniki). For more information, please, visit: www.billbalaskas.com. For high resolution images of the artist’s works, please, contact: info@kalfayangalleries.com.